There's never any shortage of drama and emotional turmoil even when an issue is light on action. 'Descender' #9 represents a table-setting chapter that informs us of all the players, some of them new whose motives become clearer. Meanwhile, TIM-21 is getting to know and trust TIM-22 more and Andy gets closer to finding his old robotic friend. There's a lot of moving parts in this issue and they all move the plot forward ever so slightly. S'Nok is dead and his son S'Lok takes the Gnishi crown and is determined to find the killers. 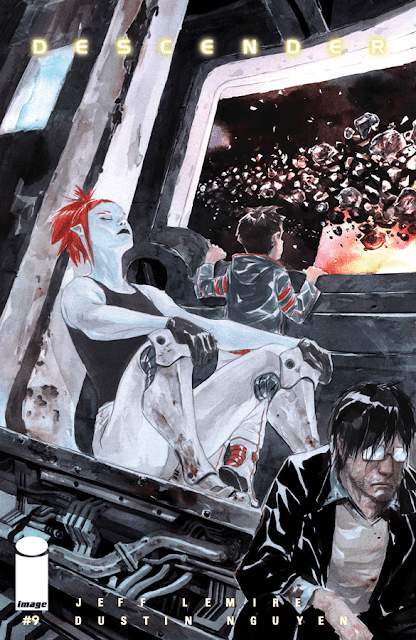 Jeff Lemire doesn't leave a thread hanging as this ups the ante going towards the arc's finale. Quon is getting on Telsa's nerves and she's not having it. We do get some details and possible foreshadowing about how the robots were designed. It's also an amusing conflict that keeps the reader engaged with these characters. S'Lok raises the bounty on his father's killers drawing the attention of Andy. Although, a new lead on TIM-21 complicates things for him and his partner Blugger. Blugger is emerging as a funny and snarky sidekick to Andy. He's the latest example of Lemire's talent for making supporting characters relevant and impactful even for seemingly a laugh but there's more going on than Lemire is alluding to. TIM-21's safety has always seemed in a precarious position. A feeling that was strongly in play when he was captured by the scrappers. In his relationship with TIM-22, he's very trusting and their chemistry is congenial. Despite their differences, 22's emotional settings are lower than his, there's a lot friendly interaction. Is TIM-22 as pleasant and safe as he seems? There's this underlying fear that he could turn on TIM-21. Dustin Nguyen continues to illustrate with magical watercolors. He can provide a lot or a little detail without losing its impact. His sketchier designs actually engages parts of your mind more because you have to fill in the negative spaces. Regardless of technique, Nguyen stuns in all phases - design, layouts, compostion - but his facial expressions pack a wallop. 'Descender' keeps bringing an entertaining space fable to life with engaging new characters and world building. Lemire adds new wrinkles and twists to the story. Nguyen continues to astonish with world-class art. You won't find a science fiction tale with more heart and intrigue that looks this good anywhere.